The phrase 熱鬧 [Canto: yeet naau; Mando: re nao] translates literally as “hot and noisy” and is a measure of the liveliness of an atmosphere. 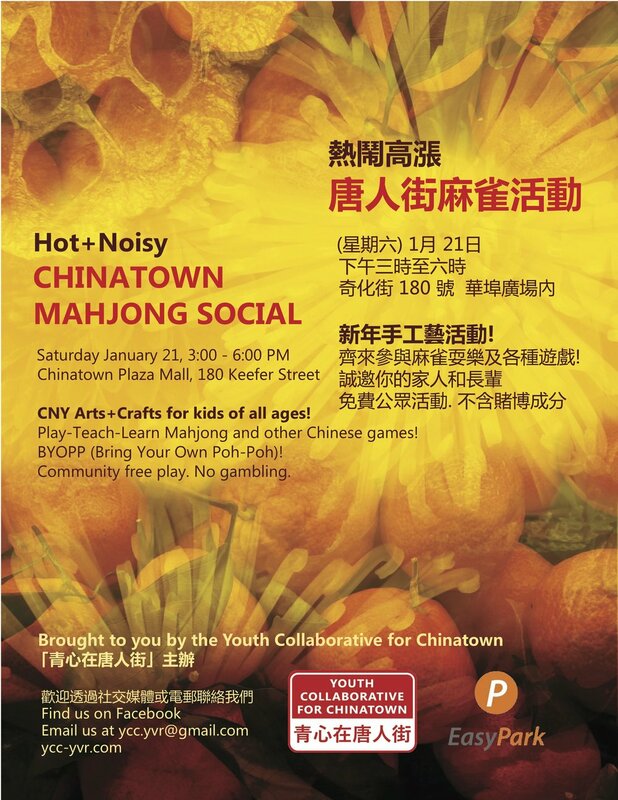 We continue to host the Chinatown Mahjong Social to bring the “hot and noisy” back to the neighbourhood’s public spaces. The Social started Summer 2015 in response to rapid changes experienced in Chinatown’s landscape, including large development projects, the end of the Night Market, and high retail turnover. As a place-keeping effort in the quickly changing neighbourhood, the free community play (and teach!) offerings of mahjong, ping pong, and childhood Chinese games help reclaim cultural practice and knowledge, ensure its transfer across generations and cultures, and practice intergenerational play with Chinatown’s seniors. The recurring format seeks to create continuity within a changing landscape, and a habit of visiting the area in pursuit of creating lived cultural experiences of Vancouver Chinatown. #hotandnoisy 熱鬧 meets Bagua 八卦 in celebration of Chinese New Year! 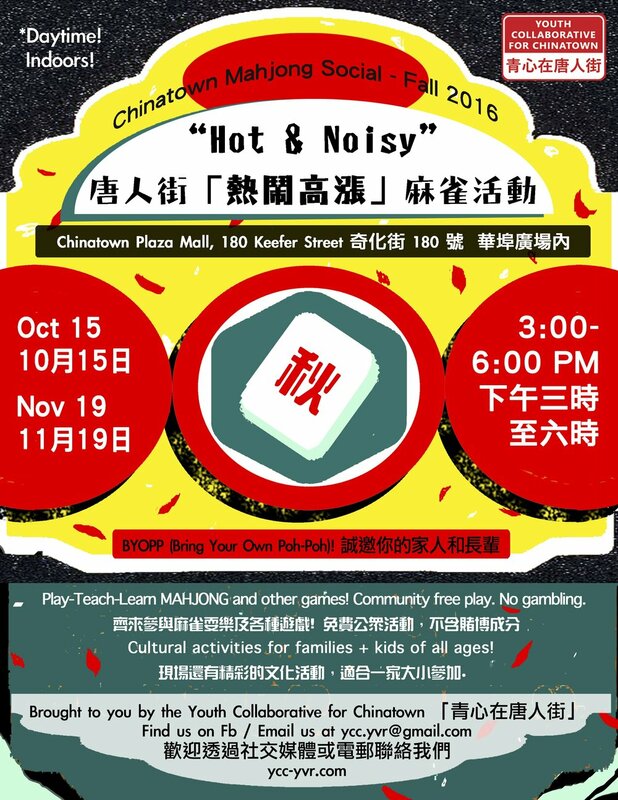 Featuring art installation by Bagua Art Association 八卦艺术家 of mahjong, ringtoss and other Chinese street games. Celebrating our third summer occupying and holding down Chinatown Memorial Square for community! Special collabs include Portrait Day for Seniors with Chinatown Pretty (San Francisco), with Family Portraits by Kayla Isomura. Part of Chinatown Summer Events. We observed the Chingming Festival by sweeping and cleaning the Chinatown Memorial Plaza, and made offerings to the ancestors at the Monument. Although not a burial site, the plaza/statue is a place of memorial. The Vancouver Chinatown community continues to observe Chingming at the Chinese altar at Mountain View Cemetery. Featuring fai chun writing, paper cutting, and making your own lion heads for a procession to the Keefer Triangle! We welcomed the harvest full moon by sampling fruits customarily enjoyed at this time of the year (HELLO POMELOS), and got crafty making (non-edible) mini mooncakes with our mooncake molds to take home! New Spring Series happens daytime indoors on the first Saturday of the month! 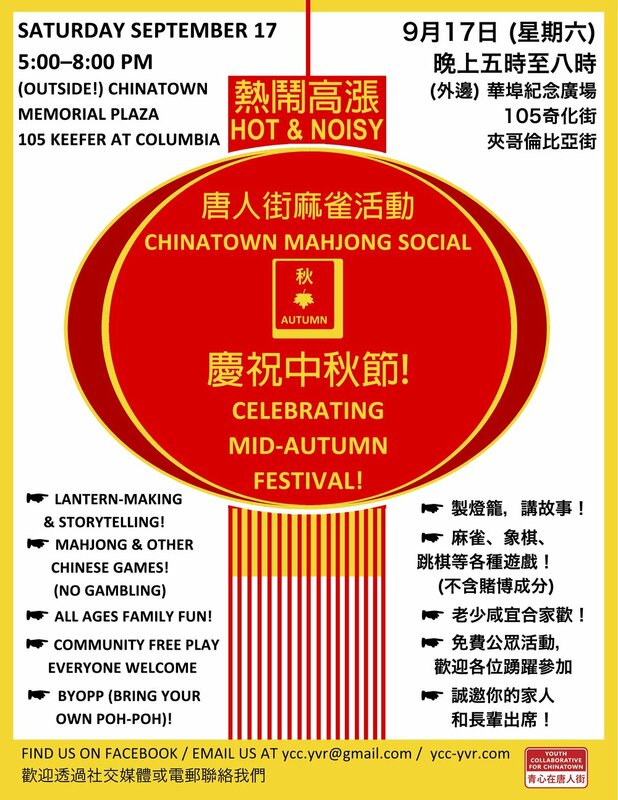 Find us outside in the Chinatown Memorial Plaza (Keefer Triangle, Keefer & Columbia) if it's sunny :) Just listen for the click-clack of mahjong tiles. Aiya! Cancelled due to snowfall!! Indoor daytime in the Chinatown Plaza (Floata lobby). Check out the Tenants and their businesses while there, including the food court (3 items on rice/noodle! ), cute shop, florist, tool shop, and barbers. Indoor daytime in the Chinatown Plaza (Floata lobby) under the venue sponsorship of its Tenants Association. With sponsorship by Hon's and EasyPark. In March, we celebrated Qingming by making seed bombs! And Hua Foundation joined us to promote their Choi Guide for the new growing season. With red envelope crafts and sampling of Chinese new year cake sponsored by Hon's. With 芝麻糊 and 杏仁糊 desserts by Hon's, and sesame rice balls (芝麻湯圓) by Kam Wai Dim Sum. Yum. Ken Lum. Story-telling by Mia. I've got love in my heart and tiles in my hand. In the beginning... We just borrowed mahjong tables and tiles from our families and friends, and tables and chairs from within the community, and presto, a party! - Making YCC an awesome banner! !